Penn State Health Milton S. Hershey Medical Center specialists are working together to form a center for the comprehensive, multidisciplinary management of patients with neurofibromatosis (NF). Leading the team are Dawit Aregawi, MD, assistant professor, neuro-oncology, Kimberly S. Harbaugh, MD, associate professor of neurosurgery, chief, division of peripheral nerve surgery, and Elias Rizk, MD, assistant professor of neurosurgery. The Hershey Medical Center team is focused on adult NF management for better function preservation, earlier detection of cases with malignant tumor progression and better management of associated comorbidities. Dr. Harbaugh explains, “If patients have access to regular monitoring at an NF specialty center closer to their homes, it’s likely that tumors and associated complications will be detected earlier, possibly helping to avoid significant nerve and soft tissue damage and to preserve function.” Dr. Aregawi says, “Despite the fact that NF is a fairly common autosomal dominant disorder [1 in 3,000]¹, many adult patients are seen by specialists only when a problem arises, with routine follow-up mostly done in the primary care setting.” A major barrier to accessing specialty care is the limited care options closer to patients’ homes, with many required to travel long distances to see an NF specialist. 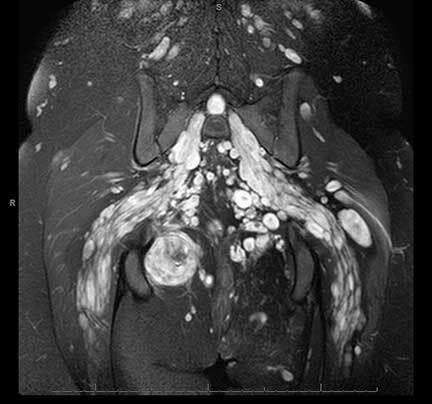 An image of coronal STIR weighted pelvic MR of a patient with NF1. The larger round tumor in the lower left of the image was malignant and was removed after chemo and radiation therapy. Adult NF patients often have very broad and complex medical needs. There are elevated risks for other diseases, such as hypertension, cataracts, breast and colon cancer, in addition to the well understood risks for malignant and nonmalignant brain and peripheral nerve tumors that can cause pain and loss of function. Most adult NF patients require treatment or consultations with a variety of specialists including a neurosurgeon, neuro-oncologist, genetic counselor, neuro-ophthalmologist, dermatologist, orthopaedic surgeons and plastic surgeons. A designated NF clinic serves as a home base and portal for access to this multidisciplinary care, making care coordination more seamless for both patients and providers. FELLOWSHIP: Neuro-Oncology, National Institute of Health; Hematology/Oncology, University of Michigan Medical School, Ann Arbor, Mich.; Neuro-Oncology, University of Virginia Medical Center, Charlottesville, Va.
RESIDENCY: Neurological surgery, Dartmouth Hitchcock Medical Center, Lebanon, N.H.; General surgery, Dartmouth Hitchcock Medical Center, Lebanon, N.H.
MEDICAL SCHOOL: University of California – San Diego, School of Medicine, San Diego, Calif.
Widemann BC, Acosta MT, Ammoun S, et al. 2014. CTF meeting 2012: Translation of the basic understanding of the biology and genetics of NF1, NF2, and schwannomatosis toward the development of effective therapies. Am J Med Genet A. Mar; 164A(3):563-78.